Ariellen Orense graduated from the New Community Workforce Development Center Clinical Medical Assistant program in July and landed a job as an ambulatory care technician at University Hospital. She’s currently continuing her education and hopes to become a registered nurse. Tasmiyah Gary currently works as an ambulatory care technician at University Hospital. 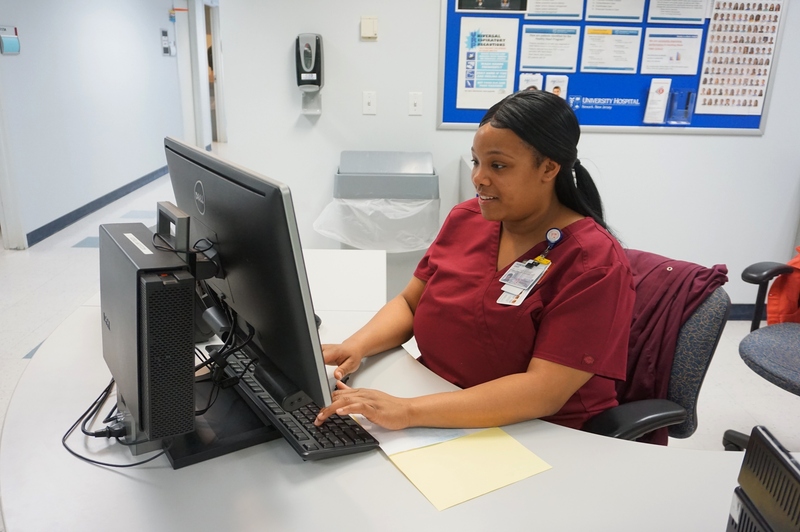 She graduated from the New Community Workforce Development Center Clinical Medical Assistant program in July and started her current job in September. When students enroll in programs at New Community Workforce Development Center, the goal is to provide them with an education and the skills necessary to obtain a job in their career of choice with a family income supporting wage. Solid training supported by employer partnerships help make that happen. Three recent Clinical Medical Assistant (CMA) graduates have started their careers at University Hospital, one of the employers with which New Community Workforce Development Center has a relationship. University Hospital is in very close proximity to Workforce and is visible from the health care classrooms, which is one of the reasons the school looked to develop that relationship. The hospital also is an anchor institution and has a well-known brand and reputation in Newark. And most importantly, it offers quality career opportunities. He explained that because of the relationship, Workforce personnel know the licenses and certifications the hospital recognizes and work closely with students to ensure they meet the requirements to be considered for jobs. University Hospital also sees the relationship in a positive light. Graduates who have benefited from the relationship are happy to be employed and are enjoying their work. Tasmiyah Gary, Ariellen Orense and Abiba Sylla all went through the Workforce CMA program and work as full-time ambulatory care technicians (ACTs) for University Hospital. Sylla started work in the summer and Gary and Orense became employees in September. ACTs work with outpatients and do a variety of tasks including taking a patient’s temperature, blood pressure, pulse, height and weight. They also do clerical work like scheduling appointments. Before enrolling at New Community Workforce Development Center, Orense was in nursing school but couldn’t afford to continue. She left school and took a job managing a restaurant but she wasn’t happy. 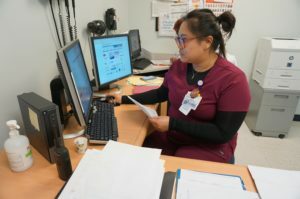 She decided to become a CMA to start her career in the medical field while continuing her education to become a registered nurse and is happy with her decision. “I really love it,” she said. She also felt prepared for her job, thanks to CMA instructor Dr. Seham Abouelhassan. “Dr. Seham taught us a lot. You could tell that she really cared about her students and really wanted us to do our best,” Orense said. Gary was working at Dunkin Donuts when she heard about the opportunities at New Community Workforce Development Center and decided to enroll. She’s happy that she did. “I feel so grateful. When I hear other people’s stories, how it took them three years to get in here, I feel very appreciative and very grateful to be here at University Hospital,” Gary said. Abouelhassan is very proud of her students for working hard and achieving their goals. She said the Workforce program prepares the students clinically for the tasks they perform on the job. “Nothing was new when they went there,” she said. University Hospital staff has found the graduates well prepared for their new roles. Brutton said the graduates’ hard work, the work of their instructor and the relationship with University Hospital all contributed to their success. New Community Workforce Development Center is an accredited post-secondary career and technical school that offers the following programs: Automotive Technician, Building Trades Specialist, Business and Computer Technologies, Clinical Medical Assistant, Culinary Arts Specialist, Diesel Technician and Patient Care Technician. The school is currently accepting applications for all programs. Fill out an application or call 973-823-6484 for more information. Our mission is to help residents of inner cities improve the quality of their lives to reflect individual God-given dignity and personal achievement. Click the link to download our 2018-2019 brochure! Our mission is to help residents of inner cities improve the quality of their lives to reflect individual God-given dignity and personal achievement. Click here to download our 2018-2019 brochure. © 1968 - Present. New Community Corporation.